If I had to choose only one word for this book it would be “eloquent.” The definition perfectly describes the book perfectly; fluent or persuasive in speaking or writing. This is easily the best book that I have ever read, and I will reread it countless times in the future and have my children read it when they are old enough, and I will forever recommend this book to everyone I meet. I’ve not read too many historical fiction novels, but I think I have to after finishing this one. It is one of the most beautiful pieces of art that I’ve ever encountered, and everyone needs to read it. One of the most amazing things about this book is that it is told from the perspective of death. Death is the narrator, and you see things from his/hers/its perspective. One of my favorite elements of this story was that each time there was a death, Death narrated it and explained it by the sky being a certain color. The sky could be blue, red, purple, yellow, black. Any color known could represent the life of the person that passed. Liesel Meminger goes to live with Hans and Rosa Hubermann after her brother died and her mother couldn’t support her. Liesel shows up and quickly becomes part of the family; Hans, whom she soon calls Papa, bonds with her soon after her arrival. Liesel meets Rudy, her best friend, while she goes to play with the neighborhood kids, and they become the best of friends and will forever be in each other’s hearts. 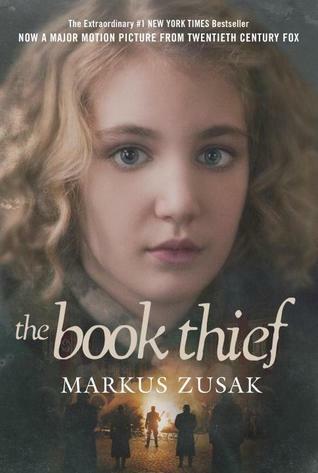 The infamous duo participate in a group of kids who steal from those more fortunate than them; Liesel ends up stealing books from a library of one of her friends. Hans teaches Liesel to read by starting with her first steal. They read every night right after Liesel wakes up from nightmares, and she learns from there. This book has so much symbolism, and touches the heart of everyone who reads it. I can’t explain the depth of the characters that I got from 550 pages. This book will forever hold a spot in my heart as being the first book to actually get me to cry real tears. There is no way for me to not spoil anything for anyone, so you’ll have to read it for yourselves, but I loved this book more than anything. The writing style was lovely. It was easy to read, but made you think about what you had just read. Again, this is easily the best book that I’ve ever read, and I don’t think that anything will beat it. I just want to thank God for creating people with this ethereal way of writing stories down. I was waiting for it. Your review, made my whole experience come back to me. It is my favourite book of all times, I can see it is yours too! Yay! Oh my gosh it was so great! Thank you for all your positive comments, they make me so happy to read!